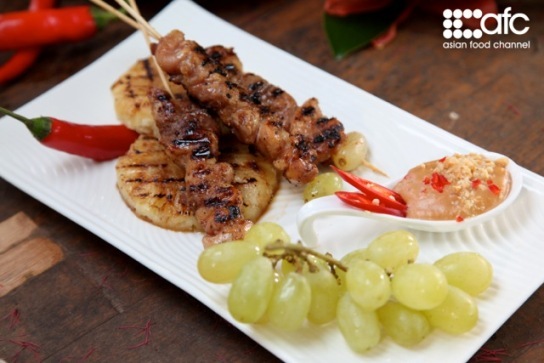 Satay is such a popular dish that it has made its way to the west too. The Asian skewered meat, barbecued over a wood or charcoal fire, is served with a delicious peanut sauce. Sometime back, I was invited to the culinary legend - Chef Martin Yan's Autumn Treasures Event at AFC Studio. The Grilled Chicken Satay was one of the dishes at the cooking demo, & I'm most delighted to share with you Chef Yan's recipe today. Cut the chicken into ½ inch wide strips & set aside. Combine the marinade ingredients together in a bowl. Add the chicken strips & stir to coat. Skewer 3 to 4 pieces of chicken onto a bamboo skewer & set aside on a plate. Repeat process with remaining chicken strips. Grill chicken, turning it occasionally until it is cooked thoroughly, for about 5 minutes in total. Serve over grilled pineapple slices & with peanut sauce on the side. Place a small saucepan over medium-high heat until it becomes hot. Add the oil, swirling it to coat the bottom of the pan. Add the garlic & cook for approximately 10 seconds, stirring until it becomes fragrant. Add the broth, hoisin sauce, peanut butter, fish sauce, & chilli garlic sauce & bring it to a boil. Reduce the heat to low & simmer for 4 to 5 minutes until it thickens. Stir in the chilli & peanuts. Set aside. Click on the link to check out the rest of the dishes: If Yan Can Cook, So Can You! Akila, I'm getting hungry myself too! Chicken satay is my favorite! Thanks for sharing this, Shirley! It looks super yummy! Mmm.... this look simple, shall try one of the days. Thanks for sharing. the barbequed satay look more tempting.. :p.. but this one look healthier.. :)..
Aki, I like both versions :) Will try this out some day. Wow, it's really yummy.Lucky U! Grilled to perfection! I would love to give it a go and try out Yan's recipe one day. How lucky to be invited to watch him cook! Choi Yen, thks for leaving your thoughts & it's great to have u here! cquek, looks simple enough to diy, doesn't it?? Heehee! I got distracted and left the house for a few hours with your page still up! I love chicken satay and have copied this recipe to test out on my book club next month..yum! Looks gooood! 2 weeks ago a friend was visiting for business and I leaned that my friend was visiting his office! I didn't know his office was in the bay area. I immediately thought of you as you just met him and he was already back here! I remember watching him in TV show those days. Evelyn, I'm sure she's also his big fan!